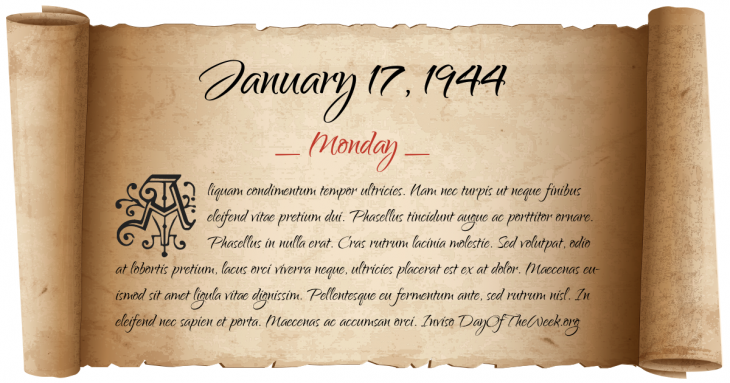 What Day Of The Week Was January 17, 1944? January 17, 1944 was the 17th day of the year 1944 in the Gregorian calendar. There were 349 days remaining until the end of the year. The day of the week was Monday. A person born on this day will be 75 years old today. If that same person saved a dollar every day starting at age 4, then by now that person has accumulated $26,028.00 today. World War II: Allied forces launch the first of four battles with the intention of breaking through the Winter Line and seizing Rome, an effort that would ultimately take four months and cost 105,000 Allied casualties. Who was born on January 17, 1944?